The First Years Y4421WMV1 - Snap-on lids are valve-free to make cleaning easy. Valve-free, spill-proof cups make sipping and cleaning easy. Durable enough to use over and over, yet affordable enough to treat as disposables. Dishwasher safe. Most lids are interchangeable with other Take & Toss products. New rainbow colors! take & toss cups, Bowls, and Flatware are durable enough to use over and over, and affordable enough to treat as disposables. Bpa free. Eases transition from bottles to cups. All take & toss items are dishwasher safe and BPA free. Removable handles grow with child. Valve-free, easy to clean. Lids are interchangeable with most other Take & Toss products. Removable handles for when baby no longer needs them. Snap-on lids prevent leaks and help to keep food and drinks fresh. The First Years Take & Toss Spill-Proof Sippy Cups with Removable Handles, 7 Ounce, 4 Pack - Dishwasher safe; BPA Free. The First Years Y1300 - Durable enough to use over and over, yet affordable enough to treat as disposables. Comes with a bonus travel cap. Y1300 features: -Take and toss cup. Reuse, toss or recycle. Ideal for drinks on-the-go. Durable enough to use and reuse, yet affordable enough to treat as a disposable. Easy-sip spout lid is spill-proof for easy traveling. Valve-free for easy cleaning. Dishwasher and microwave-safe. For children 9 months and up. Lids are interchangeable with most other Take & Toss products;Dishwasher safe; BPA Free; Phthalate free. Snap-on lids are valve-free to make cleaning easy. The First Years Y1176MP - Snap-on, valve-free, spill proof lids are easy to clean. Our popular Take and Toss 10 oz. Comes with a bonus travel cap. Sip sip hooray! durable enough to use over and over, yet affordable enough to treat as disposables. Lids are interchangeable with most other Take & Toss products. 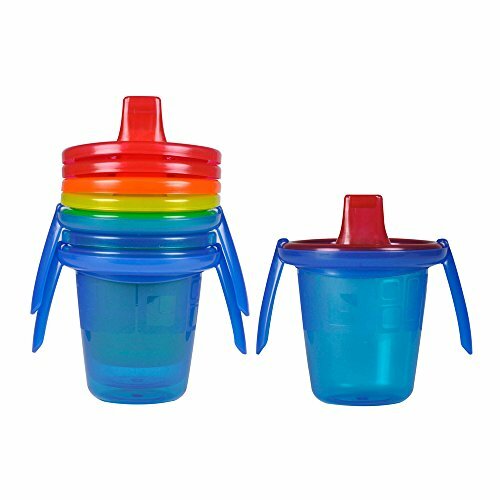 Lids are interchangeable with most other Take & Toss products;Dishwasher safe; BPA Free; Phthalate free.
. Sippy cups sometimes have a way of going missing-whether they’re left at the park, lost at preschool, or hidden under the car seat. Snap-on lids are valve-free to make cleaning easy. Your child will love the colorful cups, spill-proof, valve-free, and you’ll love the snap-on, interchangeable lids that are easy to clean. The First Years Take & Toss Spill-Proof Sippy Cups, 10 Ounce, 4 Count - Age: 9 months and up. The bonus travel cap is included for on-the-go sipping. Sippy cups are durable enough to use over and over, yet affordable enough that it’s not a huge deal if they get lost. Fun colors that you can see through so you know how much drink is left. Comes with a bonus travel cap. Durable enough to use over and over, yet affordable enough to treat as disposables. The First Years Y1184 - The fork’s rounded tines and spoon-like shape encourage self-feeding success. So convenient, you’ll be over-the-moon for these forks and spoons! Durable enough to use over and over, yet affordable enough to treat as disposables. Lids are interchangeable with most other Take & Toss products. Age: 9 months and up. Durable enough to use over and over, yet affordable enough to treat as disposables. We’ve got the solution for on-the-go feeding—and it’s flat-out great! Take & Toss Toddler Flatware is durable enough to use over and over, yet affordable enough to treat as disposables when you’re not near a sink. The First Years Take & Toss Toddler Flatware, 16 Piece - Snap-on lids are valve-free to make cleaning easy. Snap-on, valve-free, spill proof lids are easy to clean. Comes with a bonus travel cap. Textured handles with finger grooves accommodate toddlers’ fist-like grip. And the spoon’s wide, deep bowl aids in scooping. Fun colors that you can see through so you know how much drink is left. Spoon's wide, deep bowl aids in scooping. Durable enough to use over and over, yet affordable enough to treat as disposables. Lids are interchangeable with most other Take & Toss products;Dishwasher safe; BPA Free; Phthalate free. The First Years Y1157V1 - Textured handles with finger grooves accommodate toddlers' fist-like grip. Toddlers are busy people-so they deserve the perfect "to go" cup with a straw, just like mommy and her iced coffee. Dishwasher and microwave safe; BPA Free. Durable enough to use over and over, yet affordable enough to treat as disposables. Spoon's wide, deep bowl aids in scooping. Comes with a bonus travel cap. Snap-on, valve-free, interchangeable lids are easy to clean, while the fast-flow straw helps keep liquid away from developing front teeth. Fun colors that you can see through so you know how much drink is left. Comes with a bonus travel cap. The First Years Take & Toss Spill-Proof Straw Cups 10oz, 4pk Colors May Vary - Take and toss cups are durable enough to use over and over, yet affordable enough to treat as disposables. Age: 9 months and up. Snap-on, valve-free, spill proof lids are easy to clean. Age- 9 months and up. Age: 18 months and up. Fun colors that you can see through so you know how much drink is left. Comes with a bonus travel cap. The First Years Y4953 - Comes with a bonus travel cap. Age- 9 months and up. Durable enough to use over and over, yet affordable enough to treat as disposables. Snap-on, valve-free, spill proof lids are easy to clean. Durable enough to use over and over, yet affordable enough to treat as disposables. Fun colors that you can see through so you know how much drink is left. Fun colors that you can see through so you know how much drink is left. Lids are interchangeable with most other Take & Toss products. Dishwasher and microwave safe; BPA Free. Snap-on, valve-free, spill proof lids are easy to clean. Lids are interchangeable with most other Take & Toss products. Fork's rounded tines and spoon-like shape encourage self-feeding success. The First Years Take & Toss Spill-Proof 4-Pack Sippy Cups - 10 Ounce Pink - Lids are interchangeable with most other Take & Toss products;Dishwasher safe; BPA Free; Phthalate free. Lids are interchangeable with most other Take & Toss products. The bonus travel cap is included for on-the-go sipping. Textured handles with finger grooves accommodate toddlers' fist-like grip. Your child will love the colorful cups, valve-free, and you’ll love the snap-on, spill-proof, interchangeable lids that are easy to clean. The First Years Y1033A4 - Fun colors that you can see through so you know how much drink is left. Comes with a bonus travel cap. Durable enough to use over and over, yet affordable enough to treat as disposables. Snap-on, valve-free lids with straws are easy to clean. Lids are interchangeable with most other Take & Toss products;Dishwasher safe; BPA Free; Phthalate free. Age: 18 months and up. Fun colors that you can see through so you know how much drink is left. Comes with a bonus travel cap. Spoon's wide, deep bowl aids in scooping. Snap-on, valve-free, spill proof lids are easy to clean. The fork’s rounded tines and spoon-like shape encourage self-feeding success. Durable enough to use over and over, yet affordable enough to treat as disposables. The First Years Take & Toss Toddler Fork And Spoon Flatware, Colors May Vary - Fork's rounded tines and spoon-like shape encourage self-feeding success. Durable enough to use over and over, yet affordable enough to treat as disposables. Comes with a bonus travel cap. Lids are interchangeable with most other Take & Toss products. So convenient, you’ll be over-the-moon for these forks and spoons! Durable enough to use over and over, yet affordable enough to treat as disposables. Durable enough to use over and over, yet affordable enough to treat as disposables. The First Years Y1185A5 - Textured handles with finger grooves accommodate toddlers' fist-like grip. Comes with a bonus travel cap. Durable enough to use over and over, yet affordable enough to treat as disposables. Fun colors that you can see through so you know how much drink is left. Durable enough to use over and over, yet affordable enough to treat as disposables. Fork's rounded tines and spoon-like shape encourage self-feeding success. Snap-on, valve-free, spill proof lids are easy to clean. Long handle for balance and an easy grip. Dishwasher and microwave safe; BPA Free; Phthalate Free. Fun colors that you can see through so you know how much drink is left. Durable enough to use over and over, yet affordable enough to treat as disposables. Take & Toss Infant Spoons - 16 pack - Wide, deep spoon bowl makes scooping and eating easier and neater. Lids are interchangeable with most other Take & Toss products. Durable enough to use over and over, yet affordable enough to treat as disposables. Lids are interchangeable with most other Take & Toss products;Dishwasher safe; BPA Free; Phthalate free. Age grade - 4 months+. Textured handles with finger grooves accommodate toddlers' fist-like grip. Munchkin 10861 - Fun colors that you can see through so you know how much drink is left. Durable enough to use over and over, yet affordable enough to treat as disposables. Age- 9 months and up. Lids are interchangeable with most other Take & Toss products;Dishwasher safe; BPA Free; Phthalate free. Kids love accessing snacks all by themselves through the soft, flexible flaps, and moms love that those same flaps help prevent food spills all over the house and car. Fun colors that you can see through so you know how much drink is left. Durable enough to use over and over, yet affordable enough to treat as disposables. Wide, deep spoon bowl makes scooping and eating easier and neater. Fun colors that you can see through so you know how much drink is left. Comes with a bonus travel cap. Munchkin 2 Piece Snack Catcher, Blue/Green - Spill-proof toddler snack container with soft flaps for easy food access. Long handle for balance and an easy grip. 2016 winner of the cribsie's Coolest Snack Container Award. Holds up to 9 ounces of snacks. Just the right size for an infant's mouth. Dishwasher and microwave safe; BPA Free. The First Years Y1301 - Bpa-free, top rack dishwasher safe, 12+ months. Spoon's wide, deep bowl aids in scooping. Fun colors that you can see through so you know how much drink is left. Durable enough to use over and over, yet affordable enough to treat as disposables. Durable enough to use over and over, yet affordable enough to treat as disposables. New rainbow colors! take & toss cups, Bowls, and Flatware are durable enough to use over and over, and affordable enough to treat as disposables. Snap-on lids are valve-free to make cleaning easy. Durable enough to use over and over, yet affordable enough to treat as disposables. Fork's rounded tines and spoon-like shape encourage self-feeding success. The First Years Take & Toss Snack Cups - 4.5 Ounce, 6 Pack - Snap-on, valve-free lids with straws are easy to clean. Age: 18 months and up. Age grade: 6 months+. Lids are interchangeable with most other Take & Toss products. Comes with a bonus travel cap. Dishwasher and microwave safe; BPA Free. Fun colors that you can see through so you know how much drink is left. Comes with a bonus travel cap.